It doesn’t take long to realize why Austin’s Grupo Fantasma is considered to be one of the hardest working Latin acts in America. The 10-piece ensemble, best known for their on-again, off-again role as Prince’s backing band, has conquered nearly every corner of the music world and shows no signs of slowing down anytime soon. Since forming in 2000, the self-proclaimed “Latin orchestra” has helped to reignite a global interest in vintage cumbia music through their big-band setup and tight-knit deliveries. Even still, Grupo has refused to align themselves with their throwback band contemporaries, instead reaching further to incorporate classic rock, jazz, funk, and even dub step into their ever-evolving sound. Crowning achievements along the way have included crowd-pleasing stints at festivals ranging from their hometown’s South by Southwest and Austin City Limits to the world renowned Montreal and New Orleans jazz festivals, and a Grammy nod for their 2008 full-length, Sonidos Gold. Still, Grupo’s reigning triumph lies in last year’s El Existential, the band’s fifth and unarguably most ambitious album to date. In addition, El Existential works with, rather than against, its vintage roots, carefully and purposely introducing current and important lyrical subject matter into structures and arrangements that would have never housed them in the past. In essence, the record acts as a bridge between new and old, building on music familiar and forgotten with a sound that’s not only contemporary, but downright infectious. In other words, keep your ears open and your dancing shoes on. 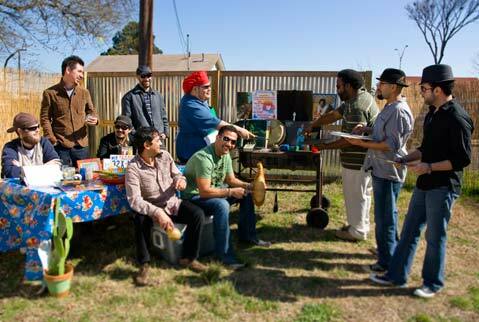 Grupo Fantasma plays SOhO (1221 State St.) this Saturday, February 12, at 9 p.m. Call 962-7776 or visit clubmercy.com for tickets and info.